The busy floor of the Stock Exchange, where stocks and shares in the world's companies are bought and sold. The Bank of England the "old lady of Threadneedle Street"is the premier bank of the world. Established in 1694 by Royal Charter, its primary object was to lend the government money. It is run by a Governor, a Deputy Governor and sixteen Directors appointed by the Sovereign. The British banking system comprises a Central Bank, deposit banks performing usual banking services, the London offices of domestic and overseas banks, and other specialized institutions outside the banking system. The Stock Exchange has about 3,300 members governed by a council of 36. It has more securities officially listed than any other market in the world; its turnover of company securities is about equal to that of all the European exchanges combined. Some 9,000 securities are quoted. The Stock Exchange does not fix dealing prices. The bargains reflect supply and demand. The deals are traditionally made verbally, and dealers stand true by their motto, "My word is My Bond". The London gold-fixing sets the basis on which most of the world's non-monetary gold is traded. Much interest centres on the price-fixing. Although all authorized banks may deal in gold, most dealings are done by the five members of the London gold market. The five meet twice daily to fix a price, and then the transactions take place for customers who have requested them for the time of fixing. Another famous world institution is Lloyds, the insurance underwriters. Lloyds is not a company: it is a market for insurance. Business is done by individuals who underwrite on their own account and at their own risk, in competition with one another. The coffee shop of Edward Lloyd, in the late 1600s, gathered the merchants with maritime interests to transact business. When they moved to new premises, they took the name of Lloyds with them. Originally they only did marine insurance, but they gradually came to offer a worldwide market for insurance of all classes. Today, with motor and aviation insurance, both losses and profits can be huge. London is also the international centre for dealings in many commodities. 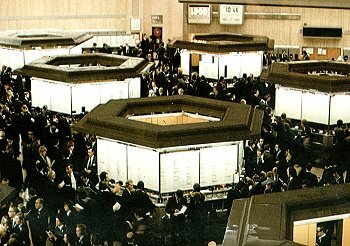 In the London commodity exchange you can see men dealing in wool, sugar, rubber, cocoa or coffee. At the London metal exchange the deals are for zinc, or some other nonferrous metal.